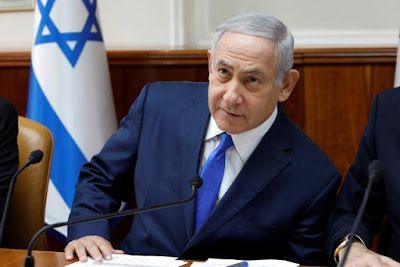 They alleged that Netanyahu granted regulatory favors to Israel’s leading telecommunications company, Bezeq Telecom Israel (BEZQ.TA), in return for more positive coverage of him and his wife Sara on a company news website known as Walla. CASE 2000 - Netanyahu is suspected of negotiating a deal with the owner of Israel’s best-selling daily newspaper, Yedioth Ahronoth, for better coverage. Police alleged “bribery, fraud and breach of trust by the prime minister” and by Yediot’s publisher, Arnon Mozes. No one in Netanyahu’s own right-wing party, Likud, is making a public challenge. The party is expected to close ranks around him in the coming election. However, some in the party harbor ambitions to succeed Netanyahu when he eventually leaves the political stage. Many Israeli voters like his security-first approach to politics. They recognize that his fluency in English and decades of experience give him an international stature that no other Israeli politician can rival. And the Israeli economy is strong. Netanyahu enjoys a particularly close relationship with U.S. President Donald Trump, who backed the Israeli leader’s consistent opposition to an Iran nuclear deal negotiated under Trump’s predecessor, Barack Obama. Trump’s decisions to recognize Jerusalem as Israel’s capital and to move the U.S. Embassy to the city were greeted with delight by many Israelis, who saw Netanyahu’s influence in both decisions. Palestinians, who want East Jerusalem as the capital of a future state, were outraged.